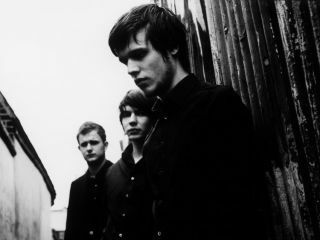 White Lies are an indie three-piece from West London. They've been around (under one guise or another) since 2005, and, with only a handful of singles under their belts, they've scored a number one album in the UK. But how was it done? Talent, of course, helps. But let's just say that goes without saying. Clever management decisions are another 'money can't buy' scenario, and there's no doubt that the Glasvegas support, an early Later With Jools Holland appearance and a coveted slot on the NME Awards Tour, didn't hinder the cause. The band changed their name from Fear Of Flying to White Lies in 2007 because "White lies are common but quite dark, and that's how we see ourselves." Fear Of Flying was not a bad name per se, but changing it was a moment of inspiration. In fact, how an effortlessly cool yet simple name like White Lies wasn't snapped up years ago is astounding. Come to think of it, the band could wear Mankinis and it would still be a vast improvement on that despicable knitwear (from the Fear Of flying days) on the left. Style should never substitute substance, obviously, but donning black clothes (as White Lies have learnt to do) adds mystique and compliments the band's lyrics. And hair. White Lies' number one album is called To Lose My Life Or Lose My Love. On it, you'll find equally depressing song titles including The Price Of Love, Nothing to Give and Death. Perhaps it's the current state of economic doom that makes us enjoy wallowing in our own miserable loathing and dark, dark self pity? Whatever, it works. The comparison with Joy Division (particularly frontman Harry McVeigh's Ian Curtis-like voice) is inevitable, but necessary. White Lies have captured the imagination of a whole new generation, and considering Joy Division's career was cut short so abruptly, it's no bad thing to hear another band continue the legacy.